We specialise in creating mobile employee apps that are integrated to a bigger solution. These can be live ‘cloud-based’ or synchronised apps on just about any platform; iOS, Windows, Android tablets and phones. The apps we get asked to build often require quite a lot of data transfer; photos, files etc. While this is generally possible on 4G data plans; we find that the actual connection often drops to 3G, which is not suitable, and there is nothing the user can do about it. Synchronisation is a safer strategy for any app that requires on-demand use and/or significant data transfer. The tablet format allows for a greater efficiency in data entry. Phones, while popular, are just too small and Apps have to employ a large amount of navigation to achieve the same outcomes. We can deploy FileMaker Go as the platform on iPad. It is not available on Android but does offer unparalleled speed of development. The iPad is cheap, light and easy to handle. Windows tablets are just too big for many deployments. 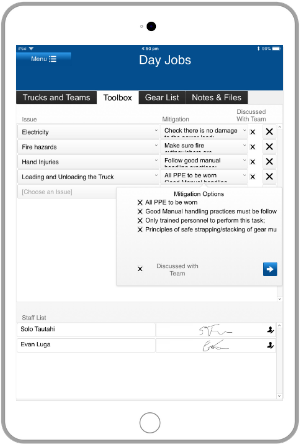 Upright Access features a two-in-one (the functions change depending on the user logged in) synchronised iPad app. It collects data entry, signatures and photos to create various site reports. GrapeWorx and VinePower feature synchronised iPad apps designed for use offline in remote (agricultural) locations.